In recent years Magnetic Resonance has developed into a very useful and powerful tool in solid state research. In this method, use is made of the Zeeman interaction of the magnetic dipoles associated with the nucleus or electron, when placed in an external magnetic field. Accordingly, they are identified as NMR (Nuclear Magnetic Resonance) or ESR (Electron Spin Resonance). This form of spectroscopy finds many applications in the investigation of crystal structures, environmental effects, dynamic effects, defects in solids and in many diverse branches of Physics, Chemistry and Biology. The first stage of the ESR circuit consists of a critically adjusted (marginal) radio frequency oscillator with 4-digit frequency display. This type of oscillator is required here, so that the slightest increase in its load decreases the amplitude of oscillation to an appreciable extent. The sample is kept inside the tank coil of the oscillator, which in turn, is placed in the 50Hz magnetic field, generated by the Helmholtz coils. At resonance, i.e. when the frequency of oscillation equal to the Larmour’s frequency of the sample, the oscillator amplitude registeres a dip due to the absorption of power by the sample. This obviously, occurs periodically four times in each complete cycle of the supply voltage. The result is an amplitude modulated carrier which is then detected using a FET demodulator and amplified by an op-amp circuit. Highly stabilised and almost ripple free power supply for the above circuit is obtained using an integrated circuit regulator. This can compensate the undermined phase difference which may be introduced in the amplification stages of the spectrometer and oscilloscope. 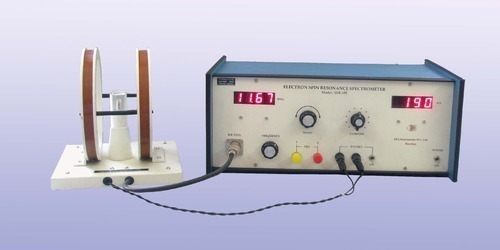 A 50Hz current flows through Helmholtz coils which provides a low frequency magnetic field to the sample. As the resonance is observed at few gauss only, no static magnetic field is applied.